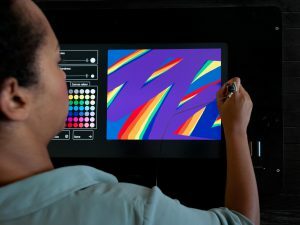 The Drawing Bar at Tate Modern is an interactive digital project that allows visitors to the gallery to get creative using a digital sketchpad. The drawings are then projected live for everyone to enjoy and instantly uploaded to Flickr. 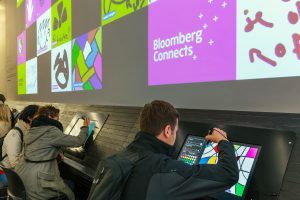 The Drawing Bar software was designed and created for Bloomberg Connects as part of a series of interactive digital projects around Tate Modern that invites visitors to connect with art, artists and other visitors. Jason Bruges Studio commissioned the studio to design and program the Drawing Bar software. 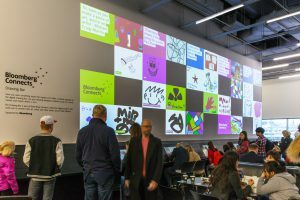 Inspired by hand-picked themes, quotes or one’s own imagination, drawings are projected live across the gallery. 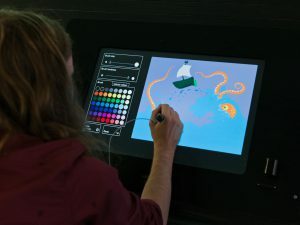 The Drawing Bar is made up of 5 x 24inch Wacom tables (screen with pens) each sat below its own projector. 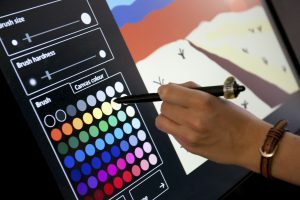 The UI was designed to be very simplistic with a limited selection of colours and using big bold brushes. 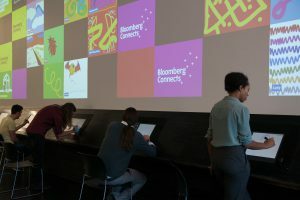 The projector for each drawing station prompts users with text outlining a theme, an image from the Tate’s collection, the previous drawing created at that station, and a selection of other drawings chosen by staff. 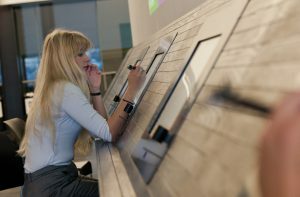 A content management system for Drawing Bar allows staff to monitor and approve drawings suitable for display across the Gallery. 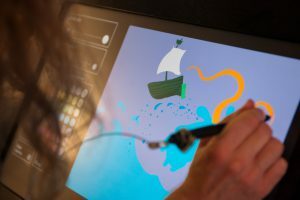 When the “artist” finishes their drawing it will be displayed on screens across the gallery with their name and uploaded to Flickr. Over 350,000 drawings have been uploaded to Flickr.